Hello and welcome to an amazing blog hop! I am joining over 65 other bloggers this week as we each spend 5 days blogging on a single topic. My topic is...wait for it.... SEWING! My other crew mates are blogging on everything from freezer cooking to raising a competitive athlete. After reading my post head on over to the crew ship to check out all the amazing topics other homeschool moms are blogging about this week. 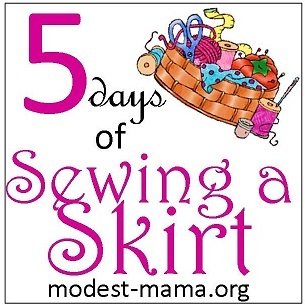 For my five days I am going to walk you through how to make a beautiful modest skirt. We will go through all the steps from drafting a pattern to finishing the hem. I would say this project is for an intermediate level seamstress. General sewing knowledge will be required as I am assuming you know basic stitching, pinning, and have a good understanding of your machine. Your completed skirt will be similar to this! Before we get started, you are going to need to gather your supplies. Choose three fabrics that compliment each other (one yard of each), matching thread, 1/2 inch wide elastic, sewing pins, your machine, and a serger, if you have one. Other things not pictured are rulers, access to an iron, scissors, measuring tape, and a large sheet of tracing paper, newspaper, or wrapping paper. You will need a ruler, measuring tape, pencil, scissors, and a large sheet of paper (tracing paper, newspaper, or wrapping paper) for this day. Step 1: Measure around your waist where you want the skirt to hang. Where my skirt hangs is 38 inches around. Since the skirt usually has nine pieces, I am going to divide that number by nine, which gives us about 4 inches. We need to add in some measurement for seam allowances (the pieces that get sewn together) and so we will add an extra inch to each piece. 5 inches is our total. This is the top measurement for our piece. Step 2: Take your ruler and your pencil and draw a line that is the length of your top. In my case, that line is five inches. Step 3: Decide how long you want the skirt part to be. Remember that your overall skirt length will be your skirt part, plus 3 inches for your waistband. I want my skirt part to be about 24 inches. Draw a straight line down from the middle of your top line the length that you desire. I have divided my five-inch line in half and drawn a 24-inch long line straight down from it. Step 4: From the bottom of your length line, measure out the length of your top line in each direction. So, since my top line is five inches, I now have a line that is ten inches long along the bottom. Step 5: Connect the top line to the bottom line on a slant. If you are hoping for a wider bottom, just add an inch or two to each side at the bottom. Be sure you add to both sides to keep it equal. Step 6: Cut out the piece and you are done for the day! Great job! Check out what others are 5 day Blogging about Here! Do you know of any links to tutorials on how to make old denim jeans and an old flowy skirt meld into one skirt? I have several "holy" (holey) jeans (it's not so easy wearing a skirt to muck a stall or ride a horse... though it can be done, I'd rather not) that need new life, and one flowy pink skirt that I stretched out last time I was pregnant. I can't bear to part with it. Any ideas welcome. Visit me at http://blessing-farm.blogspot.com and let me know. Thanks! I'll be checking back to see more of your skirt making. Cute skirt! Following along, would like to make it when life slows down! I never really learned to sew, but this makes me want to sign up for lessons! I just told my girls the other day that as soon as VBS is over (I'm in charge of crafts) we are going to make several skirts. I will be coming back to follow your directions next month. It looks so cute. My 11 year old followed your directions and made a skirt for her sister. It turned out so nice. Thanks for your directions.